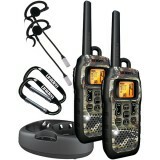 The Uniden GMR3799 is a high quality, out of the box ready, radio set with a 37 mile range. Its 22 channels will allow for a myriad of communication options. People looking for a new hunting radio or even families thinking about setting up a neighborhood watch would all be pleased with the functionality and quality build that that GMR3799 offers to its users. With a longer range than most radios in this price range offer, this radio has it all. With the addition of weather alerts and hands-free communication methods, people looking at this radio will be pleasantly surprised with all that it has to offer. The Uniden GMR3799 provides an affordable means of short to moderate distance communication for a variety of situations. With such a long range, it is capable of servicing a large number of needs that other radios would not be able to service. Hunters, fishermen, or even families looking to bolster their emergency preparedness kit will find this unit to be a joy to use and operate even under the most stringent of circumstances. A broad range of accessories work with this radio system as well, so you will never have a problem extending your functionality using the latest and greatest accessories on the market (including headsets). With a fast charging and long lasting rechargeable battery pack included with the unit, you don’t have to worry about losing your battery just when you need it the most. The design of the radios assists with elongating the battery life to begin with and, as if that was not enough reason to take a close look at this system, you can utilize loose batteries in place of the rechargeable battery packs as well. Also included are a battery level meter and a low battery alert which will go off when the battery that is being used in the unit is beginning to run dangerously low. Crystal clear communication is a guarantee when purchasing any unit from Uniden, including the GMR3799. 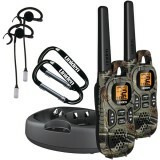 With a very long, 37 mile, range and the addition of 22 channels (and 121 subcodes) you can be sure that you will have no trouble communicating privately and effectively with your friends and family when using these radios. Communication is clear and free of static, extra noise, or other issues that plague some of the radios that are at a similar price point. Another useful inclusion is the NOAA weather function. This will alert you automatically to any NOAA weather alerts or emergency bulletins that go out. An extremely useful function for anyone who has ever known the terror of being caught outside, alone, in the woods in the middle of a thunderstorm that came in unexpectedly. No more worries about that, though. The GMR3799 will keep you in the loop regarding any new weather changes and any important information for your local area with just the push of a button. Finally, and perhaps best of all: the GMR3799 comes with a 3 year warranty from Uniden. If at any time in the first 3 years of ownership your unit becomes damaged due to a product defect or a design flaw, you will be covered. Uniden will either fix the unit or replace it at no cost to you. A warranty like this makes purchasing the GMR3799 a no-brainer, especially considering an aftermarket warranty of the same quality would cost upwards of a hundred dollars.